Why do you want to attend camp? The reasons I want to go to camp would take much more than a mere essay to explain and understand. Maybe it’s the friendships I’ve made there. The fact that the people who used to be complete strangers have become my absolute best friends, and people that I can trust with anything and that I still keep in contact with. In fact, the simple thought of not being able to see all 18 of them together again makes me want to burst out in tears. Maybe it’s the counselors. The amazing influences that are always there for you… Taryn Burns, Kalley Ridgway and Kendall Beeman just to name a few. They feel like family and you can talk to them about anything, whether it’s a serious matter or just sharing a story, laughing and having a good time. Maybe it’s the escape. The escape from all technology, your home, and the constant drama and worries from “the real world.” The way that you could have a million and one things on your mind but are still able to feel something that many people dream of, complete and total bliss. Maybe it’s the experience. The way you would do anything just to relive your summers at Waukeela. The pictures I have all over my room, the pinecone necklace that I haven’t taken off once, the background on my phone and computer, my paddle club ring and bracelet, my journal, everything I could possibly do to keep camp with me year-round as a constant reminder of… how much I miss it. The four weeks flew by like seconds and the year until I see it again… ages! So, you could ask me again, “Why do I want to attend camp?” But, more than want, I need camp. 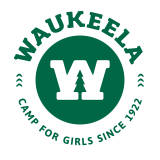 I am a Waukeela girl.